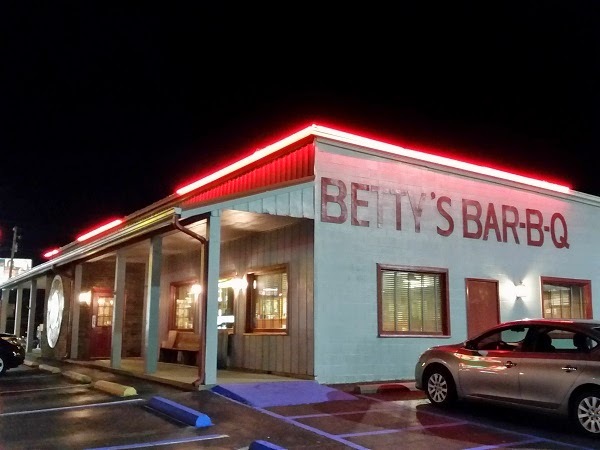 Betty’s Bar-B-Q, Anniston AL – Marie, Let's Eat! 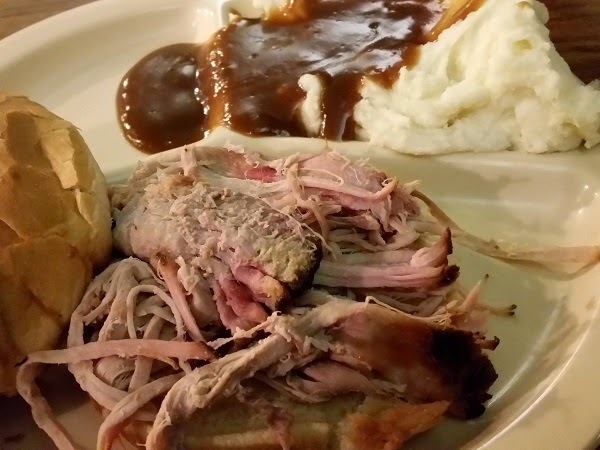 In early 2014, one of the five or six best barbecue restaurants in Alabama closed after a run of 63 years. It was called Goal Post and it was really terrific. It was a place that I had wanted to visit for ages on the strength of its terrific sign. 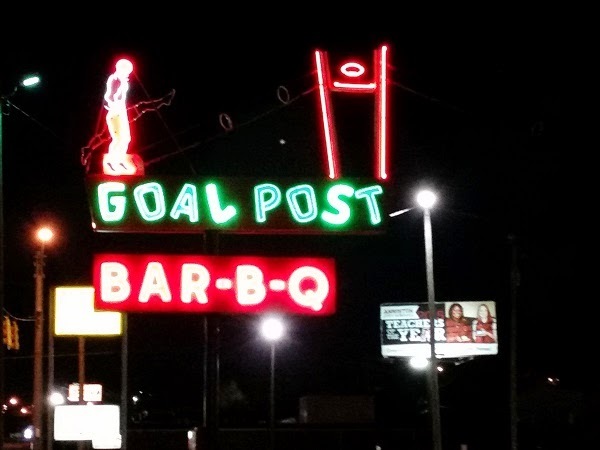 See, anybody can say that some barbecue is good, and sometimes you can trust the source and sometimes you don’t know them, but you see a picture of a sign as amazing as Goal Post’s, and you just have to see it in person. Art’s like that. So in the summer of 2013, I finally made it to the restaurant, had a great meal, admired the sign, and made my way home. Sadly, they closed for good about eight months later. The owner’s longtime fight with city hall about the no smoking ordinances in Anniston probably had a lot to do with it. It really stinks when a classic business closes and its iconic signage is lost. Fortunately, a neighboring barbecue restaurant on Quintard stepped up and agreed to preserve the sign. You can see it in the daylight by clicking the link above, and you can see it in all its nighttime glory in the image below. We sort of had to time this just right, because I wanted to arrive after dark to see the sign lit, and the animated football “traveling” through the uprights and to the roof of Betty’s Bar-B-Q, but there’s really only about a thirty-minute window in the spring since Betty’s closes very early, at 8 in the evening. I got in just in time to order and have a quick meal, and they locked the door and switched off the sign after I left. I’m not usually in the habit of ordering mashed potatoes, or “creamed” as they’re called here, with barbecue, but our server was especially keen on them and told me, truthfully, that their brown gravy is delicious. The meat is pulled and really could use a few whacks from a cleaver before it’s served, I’d say. It was a little bland, but it would be fair to chalk that up to end-of-the-day syndrome and is probably better if ordered in the afternoon. The sauce is a dark red tomato-with-vinegar blend and the pork that I had really did need it. The flavor reminded me of Gibson’s in Huntsville. After I ate, I returned to the car, where our son was waking from his nap and Marie, who elected to stay with him and pass on yet another meal here, expressed some pleasure in sharing my pleasure over that awesome sign. We had hoped to visit the Tasty Dip in Heflin on our way home (see the link about Goal Post in the first paragraph), but they’d closed by the time we arrived. We got milkshakes from the local Jack’s instead and were back home around 11.20, having finished a really fine day trip, with five restaurants, lots of exercise, a pretty campus, a fun children’s museum, three extremely cool vintage signs, and a little time with my older son. Every Saturday should be so good. Are you planning a barbecue road trip? You can see all the barbecue restaurants that we have visited for our blog (more than 330 !) on this map, with links back to the original blog posts! Posted on May 18, 2015 August 21, 2017 by Grant G.Posted in alabama, barbecueTagged alabama, anniston, barbecue, north alabama. I’m glad you guys had such a great day! Our next day trip was to Chattanooga, and it was a pretty good day too! Chapters about that should start next Wednesday… stay tuned! Pingback: Pruett’s BBQ & Catfish, Gadsden AL – Marie, Let's Eat!